The town of Moscow, Indiana was hit by a tornado in June of 2008 and its historic covered bridge, built in 1886, was completely destroyed. 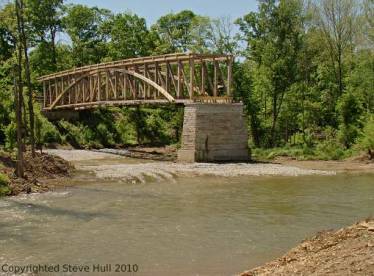 The bridge was 340 feet long and spanned the Big Flatrock river. 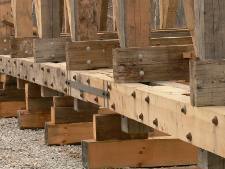 Around one third of the original timbers were salvaged and work was started on a new bridge in November, 2009. In January of 2010, Portland Bolt received a request for almost 1,000 3/4″ diameter square head bolts to be used in the construction of the new bridge. The bolts ranged from 22″ to 36″ in length and were to be supplied with square nuts to enhance the historical appearance of the new bridge. Lead-time for the supplies was critical because the bridge was being built in the middle of winter. We were able to ship the order within two weeks to the contractor on site so that the project could stay on track to be completed in the spring of 2010.